Goth and glam metal fans get ready!! The Black Veil Brides are back on the road with their upcoming brand new album “Vale,” with Asking Alexandria joining them as support! Coming LIVE to the Stage AE on Wednesday 17th January 2018 – don’t miss it!! Get your tickets NOW while you can!! The Black Veil Brides caused a stir in the modern metal scene from the moment they first crashed onto it with their debut album “We Stitch These Wounds,” hitting No.1 on the Billboard Independent chart. Their fourth album in 2014 showed how much their popularity had skyrocketed since then, making it to the top 10 of the Billboard 200! The band released their newest single “The Outsider,” in December 2016, but the release date of their fifth full-length record was pushed back to 2018, with the band intent upon perfecting it prior to release. 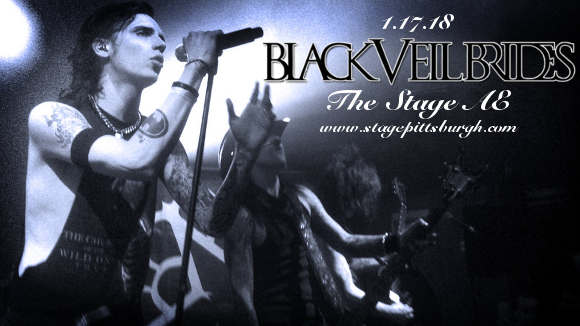 Be among the first to hear the new Black Veil Brides record live – book your tickets to see them TODAY! !